Timothy Keller asks “Do you know what it means that you are God’s workmanship? What is art? Art is beautiful, art is valuable, and art is an expression of the inner being of the maker, of the artist. Imagine what that means. You’re beautiful, you’re valuable, and you’re an expression of the very inner being of the Artist, the divine Artist, God Himself. You see, when Jesus gave Himself on the Cross, He didn’t say, “I’m going to die just so you know I love you.” He said, “I’m going to die, I’m going to bleed, for your splendor. I’m going to re-create you into something beautiful. I will turn you into something splendid, magnificent. I’m the Artist; you’re the art. I’m the Painter; you’re the canvas. I’m the Sculptor; you’re the marble. You don’t look like much there in the quarry, but I can see. Oh, I can see!” Jesus is an Artist!” And you beloved are His crowning achievement, His masterpiece! “While Milton’s epic poems Paradise Lost (which was our position in Adam) and Paradise Regained (our eternal position in Christ) are true masterpieces, they pale in comparison to the masterpiece of the true child of God. The world says that each of us is a product of our environment or a product of our own experience. Even Christians have a tendency to think that way. But God’s Word declares that the believer is actually “the product of God. Think of poiēma in the context of a potter. Does the pot say to the potter, “Well, you know that I had a little something to do with what I have become?” Of course not; the clay has nothing to do with the process. It’s the potter who goes out and seeks the clay, brings it into his workshop, and molds it according to his own vision. Likewise, the “Divine Potter” molds us into vessels He can use. That’s exactly what Paul illustrated to the Romans, in fact: “Nay but, O man, who art thou that repliest against God? Shall the thing formed say to him that formed it, Why hast thou made me thus? Hath not the potter power over the clay, of the same lump to make one vessel unto honour, and another unto dishonour?” (Ro 9:20-21). J C Philpot – Consider what is here declared of those who are saved by grace through faith—that they are God’s “workmanship”—the fruit and product of His creative hand. All, then, that we are and all that we have that is spiritual, and as such acceptable to God, we owe to the special operation of His power. There is not a thought of our heart, word of our lips, or work of our hands, which is truly holy and heavenly, simple and sincere, glorifying to God or profitable to man, of which He is not by His Spirit and grace the divine and immediate Author! Blessed Redeemer, pure as Thou art! As creationist Henry Morris says “God has written two poetic masterpieces, as it were, one in the physical creation, one in the lives of men and women redeemed and saved by His grace (Eph 2:8). Both give eloquent testimony to the eternal power and Godhead of the Creator-Redeemer.” Two great “divine poems” – thecreated world and re-created, redeemed men and women in that world. Even as the “heavens are telling of the glory of God and their expanse is declaring the work of His hands” (Ps 19:1–note), we too as God’s MASTER CREATIONS should never be ashamed to let others see His WORKMANSHIP in us by our Spirit enabled obedience to Jesus’ command to “Let your light shine before men in such a way that they see your GOOD WORKS, and glorify (give a proper opinion of) your Father Who is in heaven.” (Mt 5:16–note) As new creatures in Christ, we need to remember that we were created for God’s glory, and created for good deeds, because it is by our good deeds that our Father gets all the glory (cf Ps 115:1–note). Indeed, the chief end of each of our lives is “To glorify God and to enjoy Him forever.” (Westminster Shorter Catechism) In summary, Eph 2:8-10 teaches that we are saved not BY good works but FOR good (supernatural) works and in the mystery of His amazing grace He even rewards us for those Spirit enabled works (cf 2Cor 5:10–note, Rev 22:12–note)! Dr W H Houghton, pastored the Calvary Baptist Church in NYC and later served as president of Moody Bible Institute. When Dr. Houghton became pastor of the Baptist Tabernacle in Atlanta, a man in that city hired a private detective to follow Dr. Houghton and report on his conduct. After a few weeks, the detective was able to report to the man that Dr. Houghton’s life matched his preaching. As a result of Houghton’s faithful life as God’s “POIEMA“, that man became a Christian. In Ps 143:5–note David prays “I remember the days of old. I meditate on all Your doings. I muse (meditate) on the WORK (LXX = POIEMA) of Your hands.” Have you meditated on the truth that now IN CHRIST, you are “the WORK (poiema) of” His hands? It is good to meditate on what God has made and rest in the confidence that “He Who began a good work in you will complete it in the day of Christ Jesus.” (Php 1:6–note). Hidden and lost, Your form within us lie! ILLUSTRATION – Kent Hughes – “In Christ we are of untold worth. This great truth may be hard to actually take hold of as we exist in frail human bodies carried along in the rush of modern-day busyness. Some of us have had things happen which make us doubt our worth. 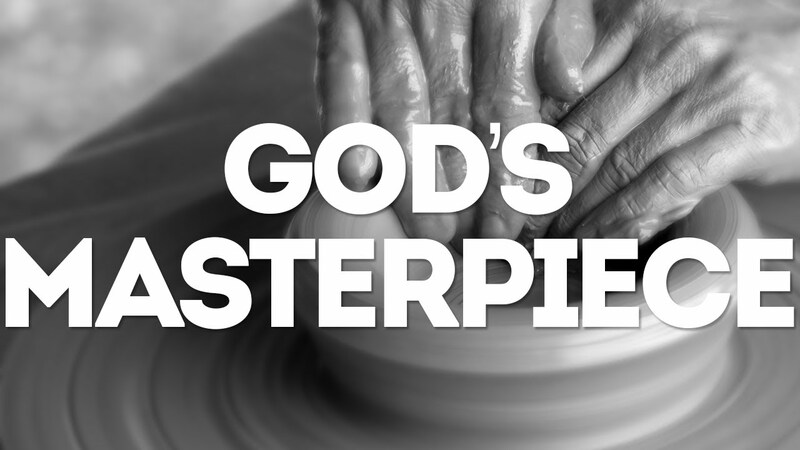 But we are His “workmanship” — His work of art. Moreover, we are in process (Phil 1:6–note). Michelangelo was once asked what he was doing as he chipped away at a shapeless rock. He replied, “I’m liberating an angel from this stone.” That’s what God is doing with us. We are in the hands of the Great Maker, the ultimate Sculptor Who created the universe out of nothing, and He has never yet thrown away a rock on which He has begun a masterwork. His tools are Jesus Christ and the Holy Spirit, His Word, and the preaching of the Word.” And often God’s Spirit uses difficult circumstances or difficult people to sculpt our character into His “masterpieces” conformed to the image of His Son (Ro 8:29–note).“In Christ” we are of untold worth. This great truth may be hard to actually take hold of as we exist in frail human bodies carried along in the rush of modern-day busyness. Some of us have had things happen which make us doubt our worth. But we are his “workmanship” — his work of art. Moreover, we are in process. Jon Courson reminds us that “God is saying, ‘You are My poetry. You’re special to Me. I’m not giving up on you.’ He is making you something not only useful but beautiful, something that is poetic.” Indeed, every believer is God’s poem in a world of prose, God’s beauty in a world of gloom, God’s fine art in a world of moral degradation. And God’s most marvelous creation is making spiritually dead men alive in Christ! Created in God’s image (Ge 2:7), yet born in sin, we are redeemed and re-created in the image of His Son. Dear saint, don’t ever forget that you are the subject the Creator’s (Jn 1:3) two creations, and as the result of His second creation, you are His ultimate workmanship, His most lyrical poem, His crowning achievement, His greatest masterpiece and you will be “on display” to show the universe the full extent of His creative genius throughout eternity! Hallelujah! This entry was posted in Bible Teachings, Inspirational Messages and tagged Artist, beautiful, christian, creation, Ephesians 2:10, God, god's masterpiece, good works, Jesus, master, new creation, new life in christ, poem, poiema, Sculptor, spirit, value, worth. Bookmark the permalink.